Package weight: 2.64lbs, dimensions: 5.51" x3.35" x3. 15"
Compatibility: for vehicles with wheel studs requiring a 14mm x 1.5 or 14x1.5 or m14x1.5 thread and wheels that take a conical/ cone seat. Specifications: 14x1.5 thread pitch, closed end cone/ conical seat style lug nuts, 21mm Hex Size(3/4" Specifications: 14x1.5 thread pitch, closed end and 60 degree cone/ conical seat style lug nuts, 21mm Hex Size(3/4" hex), 2.0"(51mm) x 0.91"(22mm) extended lug nuts. 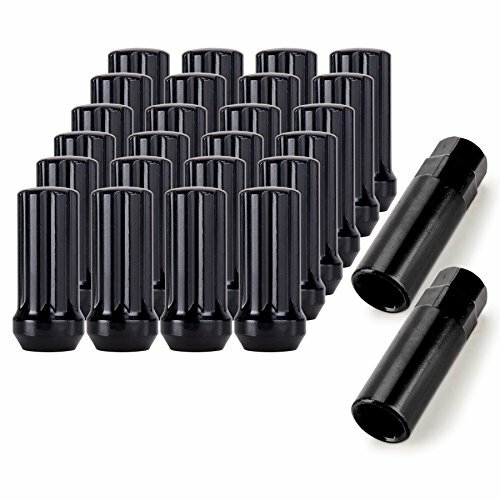 hex), 2.0"(51mm) x 0.91"(22mm) extended lug nuts. Triple black plating with essential layers of copper nickel and chrome to provide exceptional strength beauty and corrosion resistance. Manufactured with cold forged and heat treated SCM 435 steel for dependable strength and durability,paint will not fall off easily. Full money back guarantee. If you are not satisfied with this product or if you have any question, please feel free to contact us. We would like to issue full refund if finally we could not resolve your problem or you are not satisfied with the result. If you have any questions about this product by OrionMotorTech, contact us by completing and submitting the form below. If you are looking for a specif part number, please include it with your message.